Exports of Goods and Services were up 13.56% y/y in 2Q 2015 previously having risen 14.17% y/y in 1Q 2015. Over the last 4 quarters, growth in exports of goods and services averaged 14.2% y/y. Most of growth in exports of Goods and Services is accounted for by growth in Goods exports alone. These rose 16.36% y/y in 2Q 2015 after rising 16.86% y/y in 1Q 2015. Average y/y growth rate in the last 4 quarters was 18.38%. In other words, apparently Irish exports of goods are doubling in size every 4 years. Which, of course, is simply unbelievable. Instead, what we have here is a combination of tax optimisation by the MNCs and effects of currency valuations on the same. Exports of Services also grew strongly in 2Q 2015, rising 10.34% y/y, having previously grown 10.94% in 1Q 2015 and averaging growth of 9.94% over the last 4 quarters. Again, these numbers are beyond any reasonable believable uptick in real activity and reflect MNCs activities and forex valuations. Imports of Goods and Services rose 16.9% y/y in 2Q 2015, an increase on already fast rate of growth of 15.46% in 1Q 2015. Unlike exports side, imports side of goods and services trade was primarily driven by imports of services which rose 21.8% y/y in 2Q 2015 (+20.7% y/y on average over the last 4 quarters) as compared to 9.0% growth y/y in imports of goods (+13.5% y/y on average over last 4 quarters). Trade Balance in Goods and Services fell in 2Q 2015 by 1.8% y/y, having previously recorded an increase of 7.4% y/y in 1Q 2015. Combined 1H 2015 trade balance is now up only EUR399 million on same period 2014 (+2.26%). Trade Balance in Goods registered 26.9% higher surplus in 2Q 2015, and was up EUR6.206 billion in 1H 2015 compared to 1H 2014 (+28.4%). 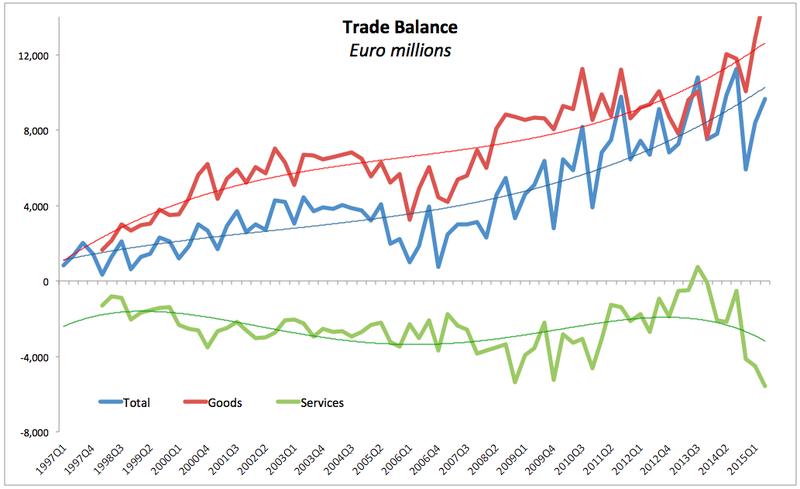 Trade Balance in Services, however, posted worsening deficit of EUR5.584 billion in 2Q 2015 against a deficit of EUR2.174 billion back in 2Q 2014. Over the 1H 2015, trade deficit in services worsened by EUR5.806 billion compared to 1H 2014 (a deterioration of 136% y/y). Irish external trade continued to show strong influences from currency valuations and MNCs activities ramp up, making the overall external trade growth figures look pretty much meaningless. Overall Trade Balance, however, deteriorated in 2Q 2015, which means that external trade made a negate contribution to GDP growth. 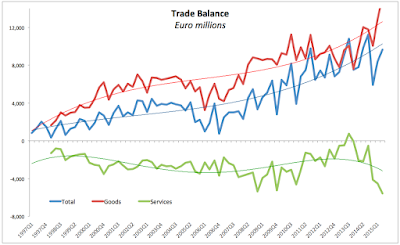 Over the course of 1H 2015, the increase in overall Irish trade balance was relatively modest at 2.26% with growth in goods exports net of goods imports largely offset by growth in services imports net of services exports. Stay tuned for more analysis of the National Accounts.